The 72-year-old has been battling sickness as the weather trains and has begun to fear he won't make it to see his birthday this month. UPTOWN — Hours before Chicago received its first substantial blanket of snow, fear loomed heavy over the residents of Uptown's Tent City like the crumbling concrete hanging above their temporary shelters under the viaducts. 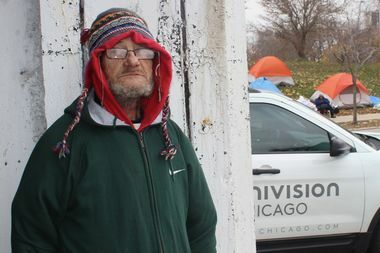 Friday morning, as the residents packed up their makeshift homes under the overpass for a regular city-imposed cleaning, 72-year-old Michael Mahoney waited and watched. "My birthday was Dec. 25, 1943," he said, wiping his nose with a rough brown napkin. "My Christmas birthday falls on a Sunday this year and I don't know if I'm going to see 73 or not." Mahoney has been sick since November and wears layers of sweatshirts for lack of a real weather-proof coat. While it only takes some residents about 15 minutes to move all their belongings to the lawn aside the busy highway for the viaducts to be cleaned, it took Mahoney nearly an hour to pack up. "Some people were supposed to help us move the stuff into storage, but they haven't showed up," he said. "They're about as dependable as that wall." The viaduct cleanings have slowed to biweekly and become less thorough as the winter approaches, residents say. They usually begin at 10 a.m.; but around 11 a.m. Friday, the 20-or-so residents were still waiting for the street sweeper to take its usual three or four passes through the Lawrence viaduct. The viaduct campers say they expect the Streets and Sanitation team was delayed by "hold outs" — residents who refuse to move their tents — at the Wilson Avenue viaduct. But minutes later, they'll learn the mechanical street sweeper isn't working that day, replaced by a crew of young workers sweeping the viaducts with brooms. "They ain't going to power wash today because its freezing," said a resident who goes by Bill. "It's just a waste of thousands of dollars." On the north side of Lawrence Avenue, a cluster of news crews speak to residents who had called a press conference to protest the frequent cleanings they claim serve no purpose but to inconvenience the homeless there. On the south side of the street, residents guard their possessions and compare notes about area shelters. The rumors don't faze Bill, who arrived in the spring and plans to head to a rehabilitation center soon to wait out the winter weather. "I'll be gone in a few weeks anyway," he said. But "people are going to start dying out here." Despite spending an average of 12-15 hours on the streets every day, Bill says he's stayed healthy by getting flu shots, taking vitamins and not sleeping outside when temperatures plummet, he said. "I ain't slept down here in three to four days because I got friends and I can couch surf," he said, adding those who aren't as lucky will "start dying out here when its dropping down to single digits at night." Just a block away is the Preston Bradley Center, 941 W. Lawrence Ave., where North Side Housing has run its 72-bed shelter since 2011. On Friday, men struggled to carry a washing machine and dryer and other appliances through the doors and onto a truck to be salvaged before the shelter closes its doors for good. The shelter, located in the basement of the 90-year-old community center, has been a refuge for those battling homelessness for "at least" 15 years, said Executive Director Richard Ducatenzeiler. But as it prepares to close, the basement is silent, except for an old TV tuned into a WWE match. Within minutes, it'll be unplugged and lifted on to the truck to be donated to another not-for-profit organization. "People have relied on this shelter for many years," Ducatenzeiler said. "People kind of come and go from homelessness. They've relied on this program. I don't know what's going to happen." When DFSS learned of the closure it "acted quickly to ensure a smooth transition for all impacted clients," the department said in a statement Monday. The program also confirmed all it clients were moved into other housing options. "Through our strong network of providers operating shelters citywide, we will ensure each of these clients has access to a safe and warm option for relocation, as well as the services they need to help reestablish permanent housing," a spokesman for the department said. The facility, which will officially close on Dec. 23, serves about 400-450 clients each year. Over the last few years, it has been operating at a deficit as costs have continued to increase. The shelter asked the city for additional funds to help with the cost, but the Department of Family and Support Services has said there's no additional funds and it can't issue a contract without a State budget, Ducatenzeiler said. While numbers from the city's point-in-time survey show the homeless population is down thirteen percent, Ducatenzeiler says the homeless problem is actually getting worse. In Uptown, data shows the homeless population grew by 5 percent. "If you ask the city of Chicago how many beds they have about 5 years ago compared to how many beds they have now as far as shelters, you'll see that its dramatically decreased... What they'll tell you is that now because they're moving towards this 'housing-first model' they've invested into housing programs, but the problem is that people are still entering into homelessness and they still need a shelter," he said. According to Ducantzeiler, the survey can't be trusted because it's conducted on one "very cold" night by volunteers who aren't specially trained in helping or recognizing homeless issues. Plus, some privately-funded shelters are not counted on the list, Ducantzeiler said. "Obviously, a lot of that is political, they kind of portray homelessness in whatever way they want," he said. For the remaining days that the Preston Bradley Center's basement shelter is operational, viaduct residents can drop in for services. But most don't qualify because they are mostly families and couples; the Preston Bradley Center is a men's shelter that only services individuals. With shelters like Preston Bradley's closing, pop-up campsites like Tent City will continue to grow, Ducatenzeiler said. "There are a lot of people that receive services in the Uptown area and need to live around here. So I'm pretty sure there will be more in the encampments under the viaducts, in the park and other places," after his shelter closes, he said.